With experts valuing the cab services in India to be $9 billion market annually, there has been a huge spurt of cab service providers and apps for the same. Though the providers like Ola and Meru are widening their respective networks and Uber has come up with cheaper services by the name of UberGo, the fact is that these providers are concentrating mainly on metros and bigger cities. Besides ignoring that an average Indian commuter does not want to pay too much. To address this issue, a small team out of Chandigarh has launched Jugnoo, a mobile app for India’s first on demand auto rickshaw service. Though the auto Rickshaw is one of the most popular modes of travel in India, it can also be the biggest nuisance. Over-hiked fares, unavailability and non-compliance of autos can leave any of us flustered. Safety too can sometimes be an issue with these three-wheelers. While most of us want the convenience and effectiveness of Uber or Ola cabs, it may still not be economical for many. The user simply downloads the app on their smart-phone, registers and can hail an auto to his location at any point in time. The service is currently available in the tri-city of Chandigarh, Mohali and Panchkula. One of the advantages of this app is that the passengers availing of the service will be required to pay only the EXACT fare for the distance travelled by them, which is Rs. 30 for the first two kilometers and Rs 10 for every km after that. The distance of the ride will be tracked by the app and conveyed to the traveler via an SMS message automatically. Jugnoo works by connecting commuters with the available auto rickshaws in the vicinity. Once the user logs in to the app, his/her location is broadcasted on a map in the app. The closest auto in the Jugnoo network then notes this and is directed to pick up the passenger. 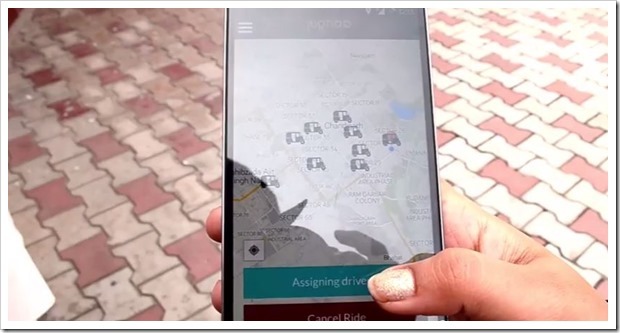 On their part, the passengers can also track the auto rickshaws location on the map in real time, estimate it’s time of arrival and can view the driver’s contact number, photograph, reviews etc. Jugnoo currently has over 50 autos registered with them. The service intends to be mutually beneficial to city auto rickshaws as any three-wheeler driver can become a member of the Jugnoo team and offer his independent services to commuters. The team screens these drivers and provides a 2 day workshop to train them in necessary etiquettes and app use. Jugnoo already has close to 4000+ registered users in the tri-city area. The app can be downloaded from Google Play store or iOS store for free. While Uber, Ola and others is redifening the cab services sector, there is still lot of scope to bring structure and semblance to Auto ricksaw travel space. Jugnoo is trying to do that one city at a time! "Jugnoo, A Mobile App For On Demand Auto Rickshaw Service. ", 5 out of 5 based on 1 ratings. I am from gurgaon and I was very happy to use the services till yesterday.. but Yesterday I had seen the worst face ever thought. I had placed my first booking around 9:15 in the morning, after what even driver had not called me to confirm where he has to come but he informed he that he reached at the place. I was wondering how could he reach before getting it confirmed, but still on second thought I assumed might be he already dropped me so how he might knew the place. So i just asked him to wait for 5 mins i am coming, and after those 5 mins when i picked up my phone then i saw a popup that driver has cancelled the booking. very great thing he had done. after that I tried to book another Auto which was showing 2 mins far from my place, than I got the one which is 10 mins far from me. than i cancelled that and thought top book another one which is more closer. by that time I was able to see 3-4 Autos near me at the distance of 2 mins. but again on several booking i was getting those autos which are not closer…… being i was getting late so i have not booked the Jugnoo any more. and later in the evening I got a ridiculous pop up that I cant use the services and later on reply to my mail rather sorry for the inconvenience caused to me one told me that due to violation in T&C’s of Jugnoo my account got deactivated.So its my question to the management of Jugnoo is – IS THIS IS THE BEST WAY TO GIVE THE SERVICES. AS YOU DONT HAVE ANY CUSTOMER CARE WHERE CUSTOMER CAN REACH YOU. RATHER THAN HELPING YOUR CUSTOMERS YOU ARE DESTROYING YOUR IMAGE, DONT YOU FEEL MAKING SUCH SYSTEM IF CUSTOMER IS TRYING AGAIN & AGAIN MIGHT BE THEY GOT STUCK SOMEWHERE SO ONE SHOULD CALL THEM AND HELP THEM MAY BE GOOD FOR BOTH. KEEPING JUGNOO AS REPUTED AND CUSTOMER SATISFIED. get upto 200rs in jugnoo wallet jst use referral code jugnoo VEERU5617 Love the jugnoo app. Give it a swirl !!! get upto 200rs in jugnoo wallet jst use referral code jugnoo “VEERU5617?..Love the jugnoo app. Give it a swirl !!! get upto 200rs in jugnoo wallet jst use referral code jugnoo “VEERU5617″..Love the jugnoo app. Give it a swirl !!! Hey, Use Jugnoo app to call an auto at your doorsteps. It is cheap, convenient and zero haggling. Use code GAURAV82 get a free ride…. Lets see how Jugnoo competes with Uber.